A week into February and it feels like spring has arrived. Was it just me or did you notice how much warmer it felt in the sunshine, how the birds were singing and it’s still light at 5pm? After a couple of months in hibernation, I’m starting to feel a renewed energy to tackle projects in and outside the home. Our garden has been looking rather sad since the building work finished and this weekend we started working out what we are going to do with it. There’s lots of grass that needs sowing and a big stretch of ground riddled with tree stumps that needs the attentions of a mini digger (I think Jim is secretly quite excited about this) There’s shrubs and hedges to plant, lots of stuff to take to the dump and round the side of our house I’m plotting a big project to transform a rather unloved yard area. To get us into the mood for it, on Saturday we spent some time helping out at the work party in our local community woodland. 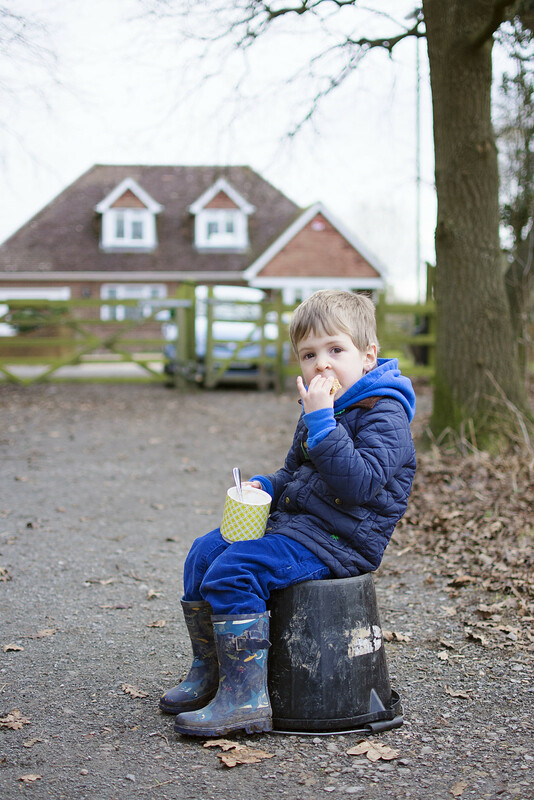 Theo always loves the chance to lend a hand (in a small way) and be rewarded with a mug of hot chocolate and some homemade flapjack. If he’s lucky he sometimes gets a ride in a wheelbarrow too. At the start of this month it was two years since we moved here, officially the longest we have lived anywhere. We’ve never really got under the skin of a location before. Just as we made friends and established a rhythm we were ripped away to start afresh. This year there is a certain delight in knowing what is coming and having friends and neighbours we will share our year with. I am itching to get out on the water, but I also want to spend time at the beach and sitting on the pitch cheering on the village cricket team. I am still under pile of snow with another 15 cm to come on Friday. Not that I am complaining as you can have a lot of fun in this type of weather and I am going snowshoeing for the first time with my Winercize (exercise + a fun evening) group. I love looking at the snow and seeing deer tracks. So I dream of my garden and it will need a pile of work after we put new siding on and a new deck. But when I see your photos I know that the promise of spring will come. Meanwhile I will keep buying bunches of tulips to give my house a shot of colour. Yes I agree, there’s definitely a Spring like feeling in the air! I can’t wait for it to warm up. Love your photos, so sweet! I love this time of year, it’s full of so much promise. I love how the evenings are getting lighter and the bulbs are pushing their way through. We’ve been in our house nearly 2 years now as well, and it has taken this long to kind of settle into it really. I love to see your photos of Theo each week, he’s such a cutie and you guys are always doing something interesting or fun! The light in the first one is lovely. Bring on spring! I totally agree! The weather is so beautiful and the lighter nights are definitely much better 🙂 He looks so cute and very happy with his hot chocolate and flapjack!